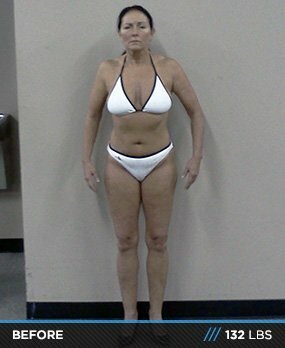 Body Transformation: Bomb Bikini Body At Age 52! An old friend convinced Shirley to compete when she could barely run. In six months, she lost 15 percent body fat and accomplished her mission on stage! As a personal trainer, running coach, and marathon runner, my life was fitness. But after a running injury, I had to retire my running shoes and look for a new challenge. I always had a hidden desire to lift weights seriously and see if I could do it. By chance, I was reunited with Bill Woolsey. Bill is a friend from 25 years ago and is now a personal trainer and contest prep coach. Bill shared his success story about losing 70 pounds and earning a pro card in natural bodybuilding. His passion for bodybuilding, training, and coaching runs deep. Through a few conversations, Bill asked me if I thought about training and competing in a physique show. What Bill didn't know is that I already had a secret desire to consider it. I decided to go through with it and compete in my first show. We only had six months until the next local show. Bill told me it would be a stretch, but if I put "everything" I had in it and listened to him we could do it. My ripe age of 51 wasn't going to stop me. I was set to turn 52 years old on competition day. On the first day, Bill took my measurements and calculated how much fat I needed to lose to compete and set the course for my training. My starting body fat was 28 percent. He said I needed to lose 22 pounds of fat (not scale weight, fat) to get below 13 percent body fat. This meant losing nearly a pound of fat per week for six months. It was a very aggressive goal, but with my fitness background, he understood I knew what it took. The weight training and nutrition was unlike anything I experienced, so I leaned on his relaxed, confidence, and motivational-type of training. As the days checked off, the patience and guidance Bill provided made me feel comfortable. The inches, fat percentage, and weight came off and my muscles gained mass. When I finished, I lost 20 pounds of fat and gained six pounds of lean mass. I felt amazing. A new me formed before my eyes. You can't imagine the outpouring of compliments and praise I received through this process. Bill was a friend, mentor, and trainer who gave me confidence and motivation to keep going. At the end of the journey, we succeeded and became winners. We didn't take the prize home, but we took pride in knowing that we succeeded past what we set out to do. What we won from this journey was much more valuable than the prize itself. Thank you, Bill, my friend forever. The meal plan that Bill provided was a sheet with selections for each food category; I checked off the foods as I ate them. It consisted primarily of tuna, chicken, mushrooms, potatoes, brown rice, broccoli, tomatoes, strawberries, and breakfast cereal. My meal plan consisted of 1300 calories six days per week with 150 grams of protein, 105 grams of carbs, and 25 grams of fat. One day per week, I got to eat 1900 calories with 150 grams of protein, 200 grams of carbs, and 35 grams of fat. I was allowed to eat cereal, milk, oatmeal, potatoes, and good fats like peanut butter and almond butter. I was given a list of food I was allowed to eat as long as I didn't exceed the quantities listed for each day. The training program Bill gave me asked that I train each body part twice per week with resistance training. It included a heavy workout for every body part once per week and a lighter workout with stability, balance, and reactive training. Cardio was done on a bike (due to my old running injury) and included HIIT and LISS training. I was allowed to do up to 45 minutes per day of cardio on the six days that I ate lower calories. On the day that I ate higher calories, I wasn't allowed to do cardio and had to work my weakest body part. We focused on lats and shoulders to give me more of a V-shape. Bill recommended shorter, more frequent workout sessions (never more than 75 minutes). His simple, patient method of training made it all possible. He provided every tool I needed and let me take the reins and go for it. With only six months to get ready for competition, the strength training was the most challenging. I always lifted, but not at a competition level. My future plans are to maintain my workout regimen that took me to the NPC Indiana Natural State Championship. I'm entertaining the thought about competing again in the near future. My advice to anyone who wants to train and compete in any physique competition is to make the commitment to yourself first. Find an experienced prep coach/personal trainer with training and nutrition certifications who helped others compete and competed themselves. Experience is the best teacher. Make sure they care about you as a person. Find a gym that offers everything you need and makes you feel comfortable. Before you know it, you will be fitted for your bikini and show time. Talk with your trainer. Be accountable to him and to yourself. Ask questions if you don't understand something. Reading the success stories fueled my motivation with determination to accomplish my goals. I ordered many supplements from Bodybuilding.com. The prices were good and I always received timely delivery.